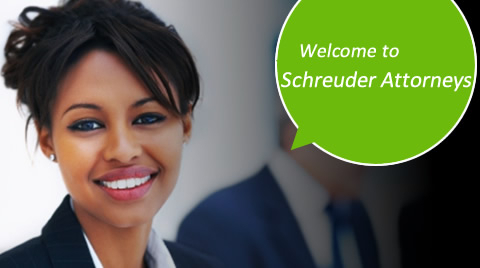 Schreuder Attorneys is a young dynamic law firm with an outstanding record since its inception in 1999. We recognise the importance of our clients' needs, and regard effective communication and professionalism as corner-stones of our business. We believe in building relationships with our clients, suppliers and colleagues within our profession, and have aligned ourselves with experts in all fields irrespective of whether these are our areas of focus or not. In addition to the above, we have also represented clients in various other services, such as restraint of trade applications, assisted with the formation of trusts and BEE schemes and arrangements in the transport industry. We have been involved in the submission of comments to National and Provincial bodies and enquiries on envionmental issues, dealt with issues relating to the formation and declaration of special protected areas, hunting, and commercial hunting in private game reserves. As well as liquidations and insolvency of corporate entities, sequestration and rehabilitation of individuals, copyright and intellectual property rights and the infringements thereof, and other various more complex legal matter.